The article on this page was researched, developed and created by John C Waugh, for use on the MERRA website. It presents the author’s findings based on that research. Some of his conclusions are different from that presented in some historical texts, but unless otherwise stated, are supported by contemporary evidence sighted. Many of the photographs and documents presented in or accessible via this website version of the article were made available for this purpose by current or past residents of our community, and the public at large. Other images and media excerpts are taken from public data bases. In the final analysis, the article provides the author’s take on our past history. Kincardine (or Kincardine-on-Forth) is a small town located on the north shore of the Firth of Forth, in Fife, Scotland. The town at one time was a reasonably prosperous minor port. It was there that, on 5 January 1832, that a son was born to Charlotte May (born 1808). The child was named James. Charlotte was not married to his father, John Lawrie, but James took his father’s surname. Charlotte then developed a relationship with James Falconer. That relationship initially yielded her two more children. Three further children followed, but the Parish Register for the town of Maykirk, north of Edinburgh, records that at this time Charlotte was James’ ‘lawful’ wife. The last of Charlotte’s children was born in 1943. 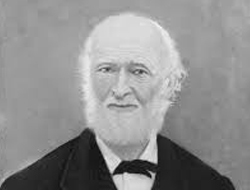 James Falconer thus became James’ stepfather. He was 9 years old at the time of the 1841 British census, and naturally enough, was ‘living at home’. When the 1851 census was taken, James was no longer recorded as being at the family home. In due course, James Lawrie sailed from Liverpool to New Zealand aboard the sailing ship ‘Red Jacket’, arriving on 17 May 1860. In that year he bought land on the peninsula. In the summary document provided to us, that land is recorded as being ‘part Lot 168, 31 acres, for 15 pounds 10 shillings’. This description doesn’t obviously correlate with the information shown on Denham’s 1853 survey map of the southern part of the peninsula. Four years later, on 17 May 1864, James married Elizabeth Jane Johnston(e) at the residence of her stepfather, John Parker of Mahurangi. Here we need to digress to learn a little about Elizabeth’s own family, for this has relevance to some of what we shall recount about the lives of James and Elizabeth. 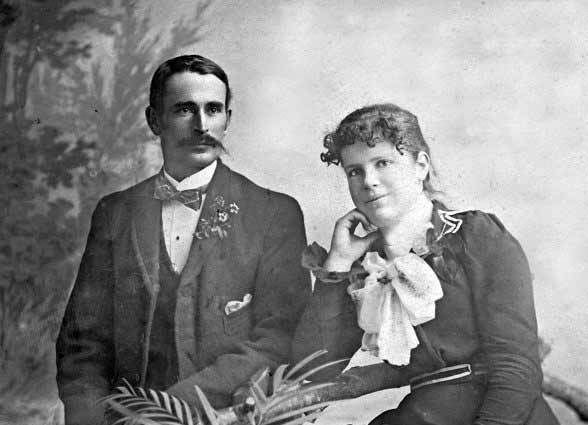 Elizabeth was born in Ponsonby, Auckland, on 2 March 1845. Her father, Captain Hugh Johnston, was a skipper on a ship involved in the Sydney-Auckland timber trade, and was a registered towmaster. Her mother was Margaret Ann Johnston (nee Stewart). She was born in 1818, and died in 1898. Captain Johnston was lost at sea, on a journey on which his ship was carrying timber spars to Sydney. It appears that the Johnston’s only son was with his father on that journey, for he too perished in that incident. At the time of their death, Mary Ann (Elizabeth’s mother) was pregnant with Elizabeth. When Elizabeth was born, she had as a sibling an elder sister who (like her mother) also was named Margaret Ann. This sister was born in 1832, at Port Lincoln, Australia. In 1862 this sister married a German-born mariner, Charles Ludwig Kasper (born 1832). The sister died in 1898. At some stage after Elizabeth’s birth, Mary Ann remarried, her new husband being John Parker. 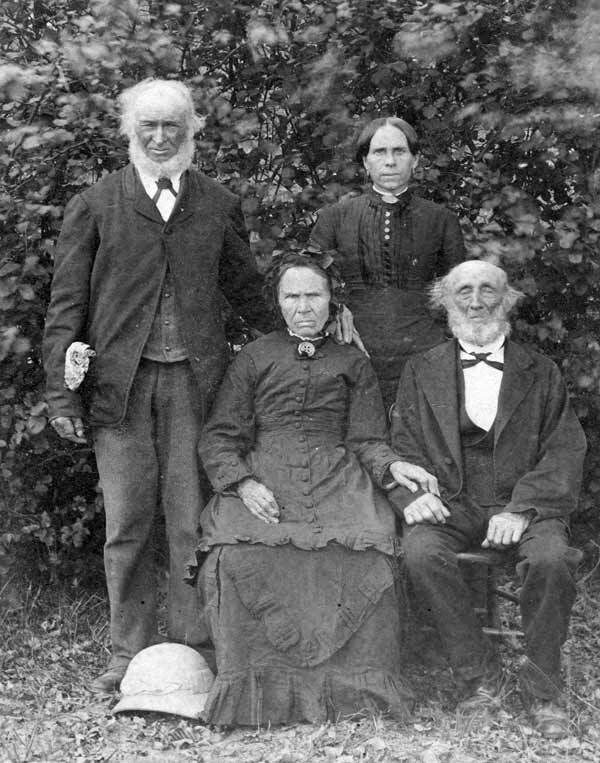 The four individuals depicted in the semi-formal photograph below are (from the top left to bottom right): James Lawrie, Elizabeth Lawrie, Mary Ann Parker, and John Parker. The dating of this photo is not known to us. Let us now revert to the main thrust of our tale … the life of James and Elizabeth (and their immediate family). 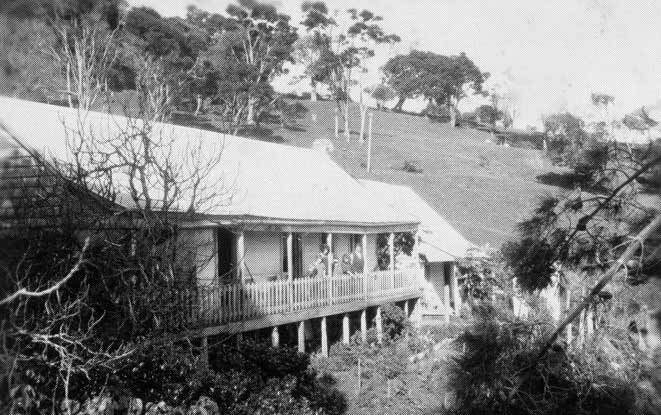 The Lawrie Homestead was built at Ngaio Bay. Noel Lipinski (nee Lawrie) has provided us with these two photos of the homestead … taken at different stages in the life of the structure. 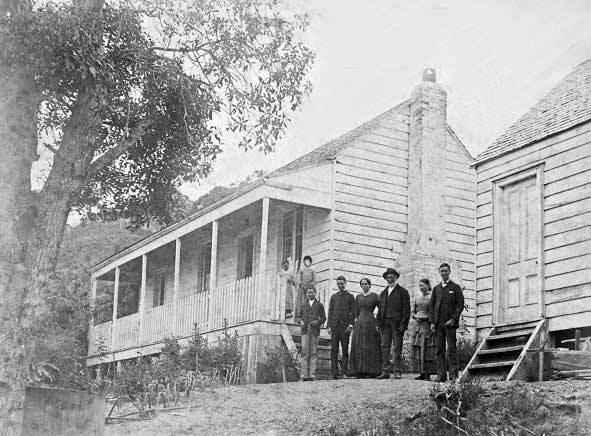 The notation beside the album photos reads ‘Lawrie Residence – Ngaio Bay 1864-1934 – Demolished about 1961’. Apparently, James spent two years on the Thames goldfields during the gold boom there. The first major discovery of gold in that area was in 1867. Seemingly, James’ spell in the Thames area was at some stage during the period of his marriage with Elizabeth. In May 1881, James Lawrie gave notice to the Licensing Commissioner for the District of Mahurangi, of his intention to apply for a publican’s licence when the next Annual Licensing Court hearing was held in the district. RH Locker, in his book ‘Jade River’, records that the licence application was for a proposed ‘eight room harbour view hotel on his property, just upstream of Scotts.’ Among the persons supporting the application is ‘George Scott’ (a son of Thomas Scott Snr). However, there was a petition to the Court against the granting of such a licence … one of the signatories to which is Thomas Scott jnr. Here is a link to a .pdf file that contains a copy of both the application and the petition. RH Locker records that the Mahurangi Licencing Court declined to grant James a licence – ‘perhaps because, in 1879, J W Darrach was granted a licence for his house at Mahurangi Heads’. You will be aware that the rubbish transfer station [‘the tip’] near Snells Beach is located in Lawrie Road. Noel Lipinski informed us that James owned a lot of land in this area, and the naming of the road was after him. On the other hand, in driving along Mahurangi East Road, to or from Scotts Landing, you’ve probably not given much thought to the naming of ‘James St’, just a little on the Warkworth side of Snells beach. Yes, that ‘James’ recognises that property in the area had been owned by our entrepreneurial local land holder, James Lawrie. 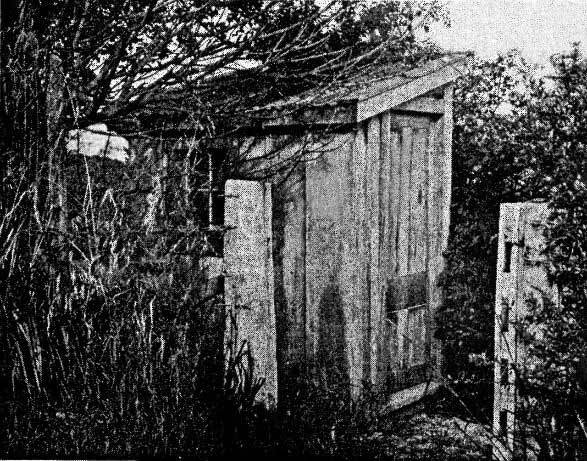 James was prominent in local affairs in the Mahurangi area. 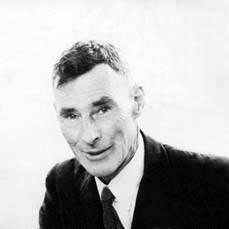 His activities included membership of the Mahurangi Roads Board, and of the local school committee. Elizabeth died on 18 August 1888, aged 43. 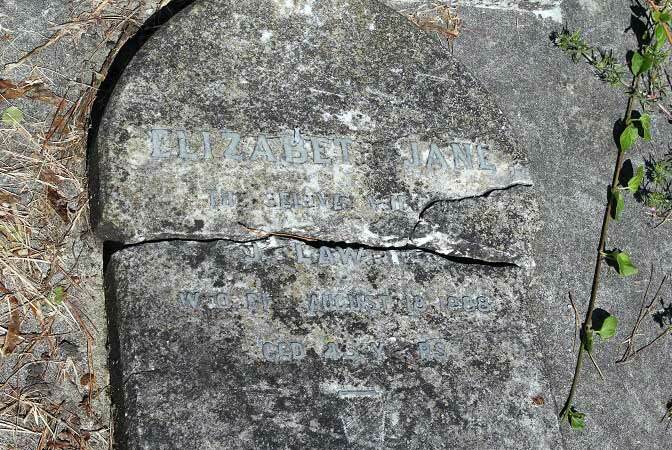 She is buried in the graveyard of the old Mahurangi Heads Presbyterian Church. James died on 20 July 1922, at the age of 90, and likewise was buried in that graveyard. 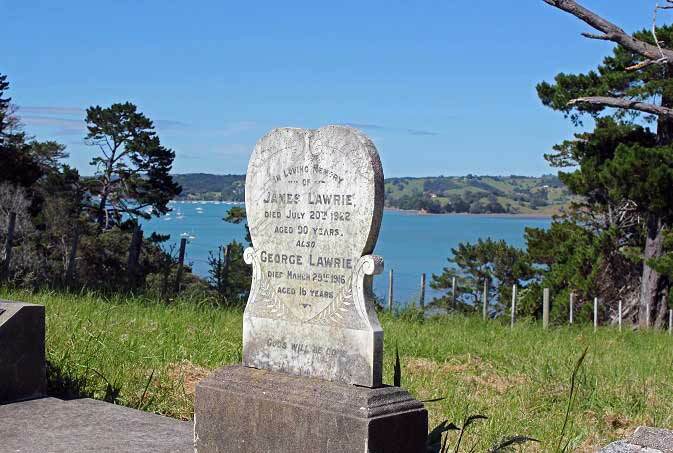 You’ll note that James’ gravestone also marks the last resting place of 16 year old ‘George Lawrie’. This ‘George’ was James’ eldest grandchild, who died of poliomyelitis (or ‘infantile paralysis’, as it then was called). Many of the individuals referred to in this article feature on tombstones or grave markers at the Mahurangi Heads Presbyterian Church cemetery. Our forthcoming vignette on the church and its graveyard will contain images of gravestones of a few of these people who were part of our peninsula’s heritage. Having read through the listed names, it will be apparent to you why we digressed a little in the preamble to this article. The chosen names for the children all had some connection with persons who featured in the life of one or other of the couple. The Lawrie family is one of those who have had a close association with the Mahurangi area, spanning over 150 years, and several generations. Using documentation very kindly provided to is by Noelle Lipinski (nee Lawrie) we’ve been able to piece together one portion of the Lawrie family tree. You may download a .pdf file containing a copy of the Lawrie family chart which we’ve created. Regrettably, and unavoidably, the .pdf file is unable to display our chart with anything like the clarity of our original ‘Excel’ chart. However, if you adjust the display size in your browser, the text becomes more readable (but it remains somewhat ‘fuzzy’). The chart does not purport to be complete in any shape or form. However, we believe the chart does provide a very useful guide to some of the Lawrie family relationships that have existed over the generations. Certainly, if after perusing the chart, you were to visit the cemetery at the site of the old Mahurangi Heads Presbyterian Church, you’d find that many of the names on the various headstones and plinths begin to have more meaning. There are many non-‘Lawrie’ surnames that are very much part of the wider Lawrie family. Hello Lucy – I live at 35 Ridge Road > Rose House that George Lawrie told me was built by his uncle & I would like to know if this is James Falconer Lawrie’s house – built 1924 ? ?